Adorable Cabin in Terrace Lakes - Pet Friendly! 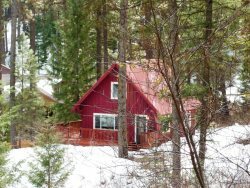 Secluded Mountain Cabin with Access to Geothermal Hot Tub and Pool! Family Friendly Cabin in the Pines with Shared Hot Tub and Geothermals Pools!